One of the things that irked me about Tuesday's council meeting, and yet was very telling, was when the council voted 3 - 2 to create a resolution to give commercial high water users a break on their UUT taxes. When asked why they would do that Mayor Walsh replied, "because we can." What arrogance! As the commenter says, what arrogance. Apparently in the opinion of The Nancinator whether you are concerned about this matter or not is of little importance. Nancy is the Mayor, and as long as she keeps her two agreeable Councilmembers in line she can do as she likes, whenever she likes. Even if it means giving special tax breaks to certain people and businesses who, get this, use a lot of water. You know, at a time when excessive water use is being strongly discouraged? But wait, isn't there something that we can do as well? Yes, there is. We can vote NO on Measure UUT and guarantee ourselves the kind of tax break The Nancinator gave to Sierra Madre businesses that use a lot of water. After all, if Nancy Walsh is able to give utility user tax breaks to those she wishes to privilege, we should give ourselves a utility tax break, too. And why is that? According to the California Form 410 that was spirited to me yesterday by invisible hands, the Yes On Measure UUT Committee was formed on Wednesday, March 12. Or one day after all of those Vote No On UUT Tax Increase signs began popping up around town this week. To me this seems like no coincidence. After having given this matter very little thought, once the "NO" signs began sprouting up all over town things suddenly changed. Bart Doyle and Nancy Walsh (who is listed on this paperwork as the Chief Officer of the UUT-istas), suddenly realized that maybe they ought to try and do something themselves. So did they wake up from their tax nap in time, or is it just too late? Is their last minute attempt to yank victory from the storm drain of defeat so YESterday? The answer is, well, pretty much. Absentee ballots are in the hands of the voters already. It is quite possible that by now hundreds have been filled out and mailed in. Meaning that Bart and Nancy are a bit behind the curve on this one. And anything they do now, such as printing their own signs, will also appear like a hurried attempt to recover from having been so completely ambushed. Again the arrogance issue comes into play. Apparently Nancy and the YES Posse were quite confident the people opposed to a 25% increase in utility taxes would do nothing. So much so that they'd be able to snooze their way to victory. A clear indication that Bart and Nancy have no real understanding of what people in town are thinking these days. Something else. By having Nancy Walsh listed as the head honcho of the Yes On UUT Committee, this now becomes a referendum on her term as Mayor as well. A move that I'd never have made if I was trying to get Measure UUT passed. By saddling their efforts with the troubled legacy Mayor Walsh they have really made things a lot harder for themselves. Do Kiwanis and Woman's Club Forums mean that much anymore? The attendance at the Kiwanis so-called "UUT Debate" gathering was 11 (not including city staff), while the Woman's Club Candidate Forum turnout was maybe as little as 20. Which does raise the question of whether these two once important stops on any Sierra Madre election trail mean that much in the age of the Internet. The Kiwanis UUT Debate was particularly absurd. As those few attending patiently waited for lunch to begin, John Capoccia and John Harabedian delivered a 45 minute long dog and pony attempt at justifying the so-called “extension” of the UUT. That they claimed to be giving both sides of this story was laughable. Their City Hall slide show offered lots in the way of facts and figures. It was also heavily laden with such mind-numbing acronymic jargon as MOU, JPIA, OPEB, etc. Most of which had to have sailed over the heads of all but maybe three people in the room. The two Johns were the only speakers. So why did the Kiwanis Club hold a "debate" on the UUT tax increase featuring two individuals that are in love with it? Susan Henderson claims she couldn’t get anyone from the "No" side to attend, and that they even looked outside of the city for supposedly unbiased parties like the League of Women Voters. A "biased view," at least in the mind of Susan, apparently being anyone opposed to Measure UUT. She certainly didn't have the same problem with bringing in those who favor of it. Of course, Susan might have gotten a real debate going had she actually asked someone from the "No" side to attend. Councilmember Koerber for one never got a call. Nor did anyone else I know. Is the Chamber of Commerce the right sponsor for next Tuesday's candidate debate? The Sierra Madre Chamber of Commerce will be hosting a televised City Council Candidate Debate in the Council Chambers at 232 W. Sierra Madre Blvd. on Tuesday, March 18th at 6:00 pm. The debate will be aired live on Channel 3 for Time Warner Customers and can be streamed live online at http://kgem.tv/category/sierra-madre-tv/. I'm sorry, but this seems like a bit too cozy an arrangement to me. If I was a candidate I'd be asking some pointed questions about this debate. So Noah gets to sponsor his own city hall debate? This is ok how? Shouldn't the fact that No(ah) Pants is a candidate as well as Chamber of Commerce officer be revealed? How can this debate be unbiased? Or maybe it's not intended to be unbiased... It's not like the Chamber isn't made up of totally self interested townies. Be sure to "like" the mannequin. if you oppose this UUT TAX INCREASE, today is a great day to show your support and request your "NO on UUT" sign. Just let the Mod know you want one (or two) and it will be promptly delivered to your yard. also, if you have received your vote-by-mail ballot, be sure to vote NO on UUT and return it right away! Sadly, the arrogance of people like Nancy Walsh is all too common for those in elected office. They think they know better than the "unwashed masses". These are the same people who are proponents of big government and the nanny state telling us all what to do because they know what's best for us. Walsh's comment speaks loud and clear for the arrogance of that mind-set. The unneeded UUT Tax is just one more example of that same mindset. They feel that they can spend our money in wiser ways than we can. If people like Nancy Walsh had their way, they would confiscate all of our money and then let the government take care of us because they know what's best for us. That's not the America I know which is founded on independance, self-reliance and unlimited opportunity for those who work hard. Nancy Walsh is leading the UUT campaign? Wow, first time she's done something since elected and no surprise it's antagonistic and full of her usual anti resident socially inept bluster. 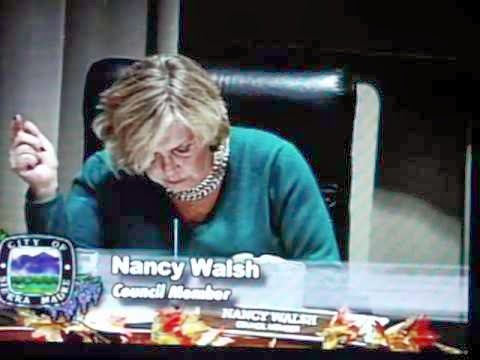 For me, one word sums up Ms Walsh's arrogance and tenure as a Councilmember. Thus we have a dilemma, will the city manager and financial accountant start doing some heavy lifting to correct Sierra Madre's financial spiral or just TAX their way out of the problem? Of course taxing is only a short term fix, like a Band-Aid, sooner or later someone with backbone and professional ethics has to take over. I am flabbergasted at the chutzpah of Nancy Walsh, talk about "lame ducks"! This woman is attempting to break the City financially as her parting shot at the citizens who didn't respond to her high handed governance tactics. Truly I think there is something seriously wrong with her mental processes. It's idiotic to say that we have a water issue and then give a break to a business just "because she can"
Everyones water bill rate just increased 19%. In July it will increase an additional 18%. That's almost 40% increase in one year. Ultimately it will increase to over 60%. The city will receive a great amount of UUT revenue on this increase. Vote NO on the UUT. Be bold. Put out a yard sign and tell your friends and neighbors to vote NO too. Don't let Nancy raise taxes just "because she can". How can the City cap business rates? Their water bill is part of their business expenses. The cost of doing business is figured into the cost of their service or product. Beside E. Waldo Ward, and the laundry mat, who are these big time users. The city is lying about privacy because in several documents in the past, it lists the big users. How id you like Haribedian trying to get the schools a break. Guess he was listening to mama. I should think the City iteself is a huge water user... was it exempted? I think an exemption can be written to basically exclude all but E. Waldo Ward and the laundry in town. The City and the ALF are not commercial and would not be exempt We need to keep Ward's a viable business for all good reasons - history, taxes, tradition. Or, rezone Wards as agricultural and give them the break they need. I'd support an exemption for Ward's because of the historical significance of the business but a laundry can pass along the rate increase to it's users. It says "protect Sierra Madre, vote yes on uut". Protect Sierra Madre from what? $36,000 municipal employee health plans? The pro-over development, pro-higher taxes side has always abused the words Preservation and Protect as a standard part of their bags of tricks. Muddies the waters, and lets them use anti-development and tea party as slanders against the true preservationists. I am going to make a sign that says the same thing. Protect Sierra Madre from bureaucracy. I hope my sign has spellcheck because I got auto corrected by my smarter than me phone. Couldn't find anyone to debate it who is against it my a$$. Try holding these functions at a time that working people can attend. The bums who want to take the money I earn are the only ones who can afford to be there at noon. You're not who they want to hear from. Theyvhold these during the day for a purpose. Sierra Madre's power brokers will run a shill to confuse and divide honest citizen's opposition to them keeping a iron grip on power. Those benefitting from the 10% UUT tax gravy train are in a state of panic. When they talk about protecting something, they're talking about themselves. City staff: Vote yes and protect me. Please. Measure UUT is about pensions, bennies and big fat health care plans for city staff. Apparently they are our children and we're expected to take care of them for the rest of our lives. Well, the Dirts are at it again. No on UUT signs are being torn down and vandalized. The downtown dirts have been doing this since 2007. They did it with Measure V signs and they are going it again. This is theft. It's a violation of free speech. It's criminal. The dirts are criminals. The Yes on UUT campaign is union and developer funded. You know out of town goons are going to be visiting us and the SMPD will turn a blind eye to all of it. Hope you voted NO on the UUT. Hope you voted for Denise Delmar who is the only one qualified for the job. I voted for Denise and Rachelle. I wish some people would get over themselves. The old saying holds true in this election. Follow the money. Protect the Sierra Madre that gives $33,000 health care packages to assistants. Didn't the city just receive more than $750,000.00 from The Kensington in development fees? Why do they need more of out money? Protect Sierra Madre from what? Honest citizens that are sick of being fleeced by crooks on the City Council and City Manager and Attorney? These are what we are trying to PROTECT the town from Please help us. At least Vote NO on the UUT TAX INCREASE, and remember when you don't vote for Rachelle or Denise, it's a vote for Green or Goss. Yes, they are risky, we hope against hope we can trust them. But the other alternative is GRIM. Green and Goss are definitely in the pocket of Unions who want raises from us via the UUT and they will absolutely be against the people of Sierra Madre. Arizmundi and Delmar......at least MAYBE they will not be liars and crooks. Take a gamble, voter for them. But whatever you do....vote NO to the outrageous and immoral TAX INCREASE . Sierra Madre is a lawless city, run by thug police and a thug city council. Just who will be moderating this so-called debate in the evening? If it is anyone from the Chamber, or a known biased Sierra Madrian, I think the candidates should refuse to participate. The moderator has the task of choosing which questions to ask from questions from the audience. My guess is the League of Women Voters is not participating this year because they were so biased last election forum, they were called out big time. The League of Women Voters actually came out against Measure V. They're in no way nonpartisan. I'm sure Ed "Trash Truck" Chen has been working them. How many Chambers of Commerce does Ed Chen work for? Sierra Madre, Rosemead AND Sierra Madre Chambers? Why? Its his job. He is supposed to be working for the cities he is representing from Athens. Well, his work product here in Sierra Madre appears to be Noah "The Mannequin Molester" Green. I don't know if I'd call that working FOR Sierra Madre. Would you? Why would the President of the Sierra Madre Chamber of Commerce be an out of town fellow who works for a trash pickup service? Easy. P.R. For Athens Trash Services. PR for Athens, remember they just negotiated a new contract with the City and wanted to get on the good side of the citizens. Would you rather have Susan Henderson? She is behind most of the mischief in the city, like Green, Nancy Walsh, etc. Bill Coburn has endorsed a Yes vote on the UUT. He cites the 2008 vote as the reason it must go back up to 10%. However, he completely ignores the 60% 2012 vote to sunset the double digit UUT and bring it back down to the 6% it was before 2008. Maybe he forgot? It will never be enough for these crooks. Coburn is just trying to get back into the good graces of the chamber and city hall. Maybe they'll throw him a bone. He has been treated poorly. The Chamber has gone to hell in a handbasket since Bill left. We have a part time mail it in president, plus a collection of some of the biggest losers in town. It is a godawful mess. Sure explains all the empty stores. The 2008 UUT was suppose to sunset. So why must it stay at 10%. At the women's club candidate night last Thur 5-7 p.m. for all you working folks to hurrry home for--only people there WC members and their male companions (hubbys and long-term boy friend of President--more later about her!) and the spouses of two of the candidates, then a real solid group of friends of Denise and John and Marti Capoccia, and Chris and Halcyon Kroeber. Neither Nancy nor Josh were there. Another run around helping guy was President of the Chamber. So, pretty paltry attendance, wouldn't you say? And the President, she was overhead to say "oh, gee, golly, how shall I have the candidates speak in turn, guess I will just play it by ear" and her ear is: set Denise off first (she did splendidly by the way) and Goss go last. What rot! Pretense at neutrality! Loved Goss's little bit of pretense at humbleness which he undid in front of one and all about being a college prof and have notes but "oh, well, I won't use them tonight." But he did use his notes. You'd think since running last time and this, he'd have his priorities straight in his head and wouldn't need notes. Loved Denise's question to Goss - if you are announcing little league games on the radio, are you also announcing girls softball? Goss can only work off a script. Chances are it is one that he didn't write. Susan Henderson is such a liar. She can't find anybody who will speak in opposition? How about allowing an unedited editorial in her paper? from the parking lot, located between Mariposa Avenue & "The Only Place in Town"? according to the title company... the lower parking lot (where the white trailer is parked) belongs to "Loyds Bank" ! Don't like Goss and won't vote for him, but he is a college professor and you don't have to be at a 4 year college/university to be a professor. If you want to crab about glorified collegeness then take a look at Grand Canyon College diploma-type mills that proliferate and take your money and give very little in return. The real tell on Goss in his self-inflaed "I am a college professor" la-de-da! is about being a department chairman as he states "it was like herding cats..." To anyone who tells you something so vain-glorious can be simply answered: "I'm sorry." 1.A person who thinks they are so much smarter than everyone else in the world. 2. A nerd with a giant ego. Nancy was at the Chamber of Commerce Tea most recently. I am sure they thanked her profusely for all the good work she has done to shore up the down-town of Sierra Madre. Actually I think it is getting along quite nice without her and glory be that will be even better soon. Psttt. She'lll be gone. Unless Green is elected and recycles her for another stint on the Senior Commission--I can hear the nice members of the Senior Commission gagging already.